Using a safety can to store and dispense flammable liquids might seem like a minor issue when running a busy waste collection facility. Yet, one company learned the severity of non-compliance the hard way. OSHA cited the company for improper transfer of flammable liquids, along with other unsafe conditions. The penalty? Nearly $300,000 in fines. OSHA specifies the use of approved containers for flammable liquids storage and handling. But, what does that actually mean? Read on to learn five helpful questions to ask when selecting a safety can. 1. Is the Safety Can UL or FM Approved? Are there flame arresters in place? These metal grids dissipate heat. They prevent ignition sources from reaching the vapors in the can. Does the can have an automatic vent? When a fire surrounds a safety can, the heat causes a pressure buildup in the can. If this pressure is not released, the can could eventually explode. 2. Is the Safety Can Material Compatible with the Chemicals I Need to Store? Material choice for safety cans is important because certain chemicals are corrosive. If the chemical attacks the material of the safety can, it will leak, creating a fire risk. 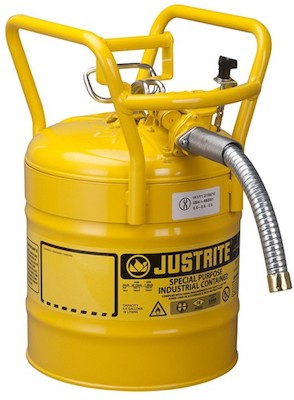 Justrite supplies galvanized steel, polyethylene and stainless-steel safety cans. Always consult the Safety Data Sheet (SDS) of the chemical involved to determine which is the best container for your application. For more information about chemical compatibility of galvanized steel, polyethylene and stainless-steel Type I and Type II Justrite safety cans, download this helpful chart. 3. What is the Minimum Size Safety Can that Meets My Requirements? The purpose of a safety can is to minimize the risk of a fire when handling flammable liquids. The more flammable liquid you are handling, the greater the consequences of a fire. If your workshop uses a 1-gallon bench can for cleaning parts, use a 2-gallon safety can for refilling. A larger can may seem more flexible, but the excess liquid would not have any advantage. In fact, it would only increase the severity of a fire if something went wrong. 4. What is the Main Purpose of my Safety Can? There are two main styles of safety cans – Type I and Type II. These styles are defined by the lid design and methods of filling and pouring. OSHA requires all business or commercial enterprises to use Type I and Type II safety cans. 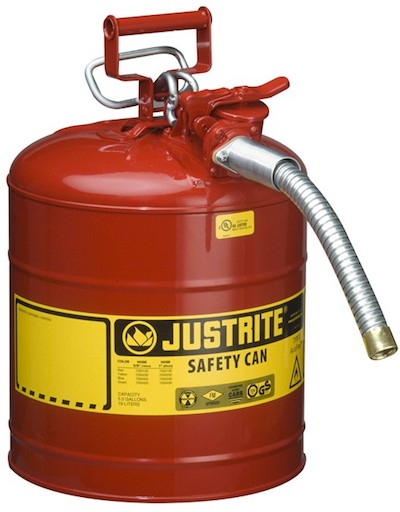 Use single-spout Type I Justrite safety cans for transferring, storing and dispensing of flammable liquids. They are often used to fill containers with large receiving openings. Justrite Type II AccuFlow™ steel safety cans feature two openings for greater convenience. The top opening provides a lift lever for filling. A second opening equipped with a metal hose allows controlled pouring. 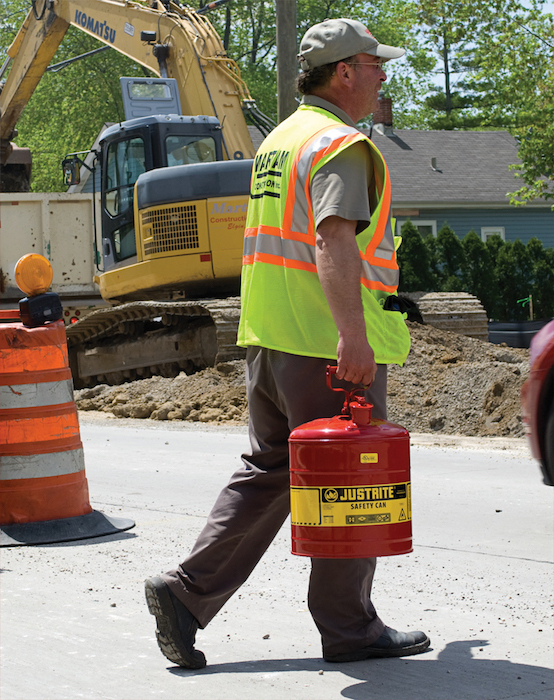 Type II safety cans offer greater protection when transporting flammable chemicals. In fact, the Department of Transport (D.O.T.) mandates Type II D.O.T. safety cans when transporting flammables in commercial vehicles. 5. What Color Safety Can Do I Need? Avoid mishaps and OSHA penalties by choosing the right safety can for storing and dispensing flammable liquids. 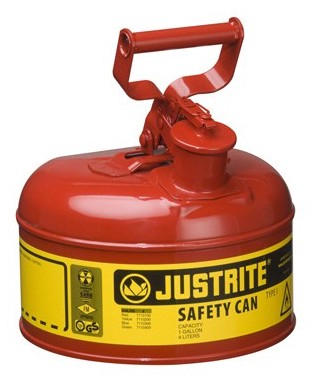 Justrite’s wide selection of safety cans and containers come in a variety of materials, sizes and colors. No matter what your application, you can find what you need here.